I’m getting into the holiday spirit already. I got a little help from hosting this year’s Friendsgiving for our close group of friends. Nothing like a gathering people you love around a table with good food to put yourself in the right state of mind. And now there’s more holiday happenings coming this weekend—it’s the annual HOLIDAY BAZAAR at the Rochester Museum & Science Center! 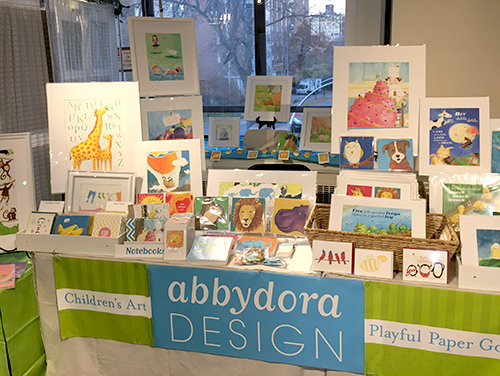 AbbyDora Design will have a booth on the Mezzanine level (606 on the map). Our table will be filled to capacity with as much color as we can fit! There will be framed and panel original art, matted fine art prints of all sizes, unique holiday cards, and many other paper goodies, too! OH! And when you stop by, ask me about the new artwork I’m creating on right now. And maybe, just maybe I’ll share a sneak peak with you.